Protesting Drones at the Air and Water Show and Everywhere! In recent weeks, there has been a groundswell of revulsion at the Obama administration’s program of “targeted killings” in Pakistan, Yemen, and Somalia using drones. And people are determined to stop the lethal use of drones around the world and for surveillance and policing in U.S. skies. World Can’t Wait is part of a nationwide effort to STOP the drones – with Chicago as a key part of the campaign. * Add your name to our drone campaign eList. 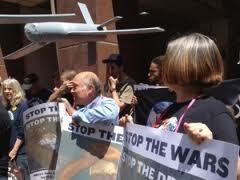 * Join us to protest drones at the Chicago Air & Water Show – Saturday afternoon, August 18. * Donate whatever you can to help finance this campaign. We are working with Occupy Chicago, Iraq Vets against the War, Protest Chaplains, and many other groups to bring a strong, creative anti-war and counter-recruitment message into the middle of this glorification of death from the sky. Join the event on Facebook and keep an eye on our Chicago WCW blog – more details will be coming soon! The national World Can’t Wait Sustainer Drive is going on now – if you appreciate the persistence, vision and mission of the World Can’t Wait, and if what you see in our work fuels your hope, please consider becoming a monthly sustainer at any level from $5 to $500. We in the Chicago chapter appreciated your support in protesting NATO in May; now we hope you will take part in growing and sustaining our nationwide strength for the months ahead. Fund Raising Party & Evening of Solidarity for Gregory! To get involved, contact the Ad Hoc Committee for Reason. Agree? Then sign this statement here! Please sign the above statement here and donate to publish it here – thank you! ← This Week We're Saying With Pride Free Bradley Manning and No To Torture!